Last month it was announced that Chuck Berry had died, aged 90. This was a passing I had often thought about in advance. I had thought about how someone as momentous, crucial and venerable as Berry was still alive. He had toured to a late age – it wasn’t as though he had quit upon turning 40 or even 65 – and I had to reflect that I should have tried to see him play when I had the chance. I had often thought: when Chuck Berry dies, all the obvious scripts will appear: The father of rock & roll … Johnny B. Goode … made it cool to play a red guitar … duck-walked and dived through a segregated world full of traps for an African-American. All true. People would play the songs and say they had loved them. I often thought: can’t we do this while he’s still alive? The same remains true, now, of Little Richard, Jerry Lee Lewis, and even Burt Bacharach – who is only two years younger than Chuck Berry! I find a clip online from the concert video Hail! Hail! Rock ‘n’ Roll (1987), of Chuck Berry and Keith Richards rehearsing ‘Carol’. I watch it over and over. It’s tremendously entertaining: partly because the music is exciting to me anyway; partly because of the rawness of hearing electric guitar sounds collide in a room; partly because of the comedy of Berry telling Richards he’s playing it wrong. 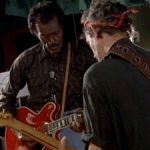 My recollection is that this happens throughout the film, Berry pulling rank on Richards perhaps because he had once heard someone else say ‘Keith Richards plays Chuck Berry better than Chuck Berry’. It’s clearly plausible, too, to see an implicit politics buried in the confrontation, with an African-American artist taking a rare opportunity to exert authority over a white man who has made greater riches by drawing on his example. I should watch the whole film again, but this clip is enough for now. For so many of its elements and moments strike me. Richards at this point is a very good guitar player: a stinging lead player as well as producer of chunky chords (in fact there are no chunky chord phrases here and come to think of it none of the unusual tunings that Richards is always said to rely on: this is clearly standard tuning). I note this because 30 years later, I’m doubtful that Richards can still play this way; on stage now he can appear to be going through the motions, his hands no longer up to it. Berry stops Richards with the claim that he isn’t correctly playing a phrase of woozy bent notes at the end of the lead intro riff. So you get to hear them both bending these notes, several times, with their different guitars. Around 0:28 you can hear them both doing it at once. At this point in history, Berry can’t be bothered to sing ‘Don’t let him steal your heart away’. He sings: ‘Don’t let him steal it away’. Nor can he always be bothered to sing ‘I’m gonna learn to dance if it takes me all night and day’. That gets contracted to ‘I’m gonna learn to dance if it takes me night and day’. The loss of the word curiously reminds me of the verbal awkwardness cultivated by late (as in 2000s) Bob Dylan. Around 0:51 the drummer looks worried and stops playing. Berry seems unsatisfied. 0:54: Richards’ face as he demonstrates ‘chugging rock’. Berry is cool and silent in response. There is something plaintive about Richards’s comic demonstration of his approach. 0:58: Berry so serene in response, leaving his disdain unspoken. Between 1:06 and 1:22 Berry twice stops Richards in full flow. He doesn’t yell, but uses silence for authority; even a quiet menace. At 1:20 Richards does a terrific take and Berry stops him: ‘You wanna get it right, let’s get working‘. 1:33: Richards’ face with a slight lemon-sour exasperated expression, hidden from Berry, as though becoming exasperated yet unable to voice any resistance. 1:46: super brief burst of lead playing from Berry who is mostly quiet during this performance. Regular cuts to band members, like the piano player at 2:00, looking anxious yet familiar with the stop-start scene and Berry’s authority. 2:10: Richards still has energy to throw expressive poses into the lead intro riff. 2:17: Berry throws in the bent-notes climax he has been complaining about as though to patch up Richards’ performance. He does the same at 3:12. 2:30 – 3:00: Berry plays squalls of lead playing in response to his own vocal. 3:07: the discordant garage noise of the two electric guitars coinciding, with unwanted notes leaking out. Richards’ solo at 3:30 gets Berry’s approval even though he misses a phrase. The passage descending from the high notes feels not like heavy blues rock but more the slightly dainty 60s sound from the time of the first Stones LP. 3:57: the expressiveness and force of Berry’s voice – and then the amused face he makes as he stands back from the mic, showing how much he is in control of his pantomime vocal effects. 4:30: You can see Berry enjoying the performance, after all. 4:43: confirmation as he says Yeah … Yeah over the lead riff’s latest iteration, and at 5:05 his broad smile seeming genuine: All right, all right!